Week 3 was a little quiet, but week 4 was pretty huge, since I was on vacation and had plenty of time to play. On the other hand, I spent most of it playing Fallout 4 instead. Still! Much progress was made. To pick up where my last session left off (and they quite often seem to end as I’m entering a dungeon), I had just stepped into the third dungeon, the Lanayru Mining Facility. 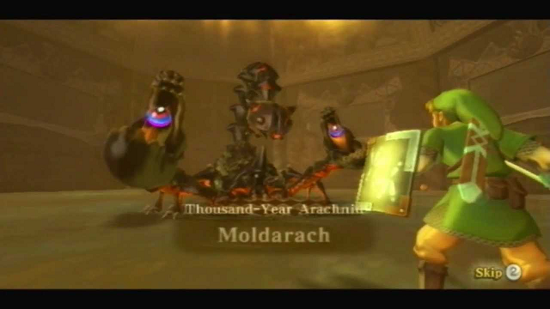 While it’s another tight, single-floor affair (I’m beginning to think that none of Skyward Sword’s dungeons have multiple floors), it felt about twice as long as the previous two and was much more enjoyable to solve. Felt a lot more puzzley, like a Zelda dungeon should be. I actually got lost at one point, and it took me a while to figure out that the key to progress was a lesson that I had previously learned while exploring the desert. As far as keeping old tools relevant? The Beetle is still used extensively here, and bombs… less so. Mostly when you need to explode something, you have to fly a bomb there via Beetle, so bomb flowers are abundant. This dungeon’s tool is the Gust Jar, which is fun for blowing monsters around, but it mostly used to blow away sand, effectively turning the second half of this dungeon into Super Zelda Sunshine. One super weird thing that took me forever to figure out is that in this game, Beamos can be killed with your sword. That’s never happened! Sometimes they’re completely invincible, but usually they must be dispatched with bombs or arrows. What’s even crazier is that you can actually parry their lasers to stun them briefly. Oh, and speaking of which, the parry maneuver (or “shield bash” if you want to be more accurate) has been my best friend this time around. I don’t know if I (ab)used it so much in my first playthrough, but my experience with Dark Souls has definitely been informing my playstyle on this run. Parrying really does make the game a cakewalk, as it works on nearly every monster, and stuns the majority of them. It even makes the otherwise tricky duels with Ghirahim incredibly easy. The downside is that shields have durability in this game, so if you whiff too many times, you’re left completely defenceless. However, the window for a successful parry is incredibly generous (compared to Dark Souls), so it’s not too bad. After defeating the unmemorable boss and clearing the dungeon, you’re treated to a sweet cutscene of Ghirahim facing off against Impa, and you end up with the Goddess Harp. From that point on, it’s just running around strumming like crazy forever. To learn some songs, you’re allowed into the big, conspicuous, cloudy dome in the sky, which I had thought was accessed much, much later in the game. There’s barely anything in there besides the tower where you learn songs (basically just a time-waster) and a little playground island. Also a rainbow and some bugs. Boring stuff. Let’s head back down to Faron Woods. This is the point when you enter the first Silent Realm. These are “trials” where you dash around nightmare versions of the area you’re in, trying to collect baubles while angry robots hunt you like an animal. People tend to hate the Silent Realms with a passion, but me, I had just completely forgotten that they existed. Turns out, I thought it was really fun! The whole affair takes about five minutes, and the Faron trial, at least, was really easy. It’s like finding the Tears of Light in Twilight Princess, but distilled and peppered with thrill. After that, you’re given the Water Dragon Scale, which allows you to swim. 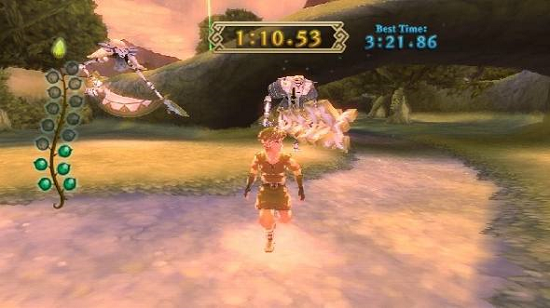 You get far more swimming control in Skyward Sword than in other 3D Zeldas, and It’s actually fairly fun. Your “tutorial” is a waterway where you get to practice jumping over gates and spinning exploding fish into boulders. 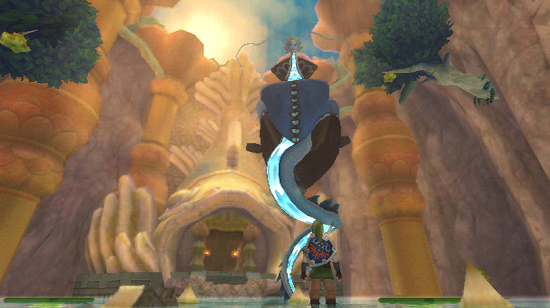 Then you meet the Water Dragon and she does something terrible… She makes you trek through Skyview Temple again. Not the whole dungeon, mind, but it’s kind of silly that you have to trudge through it a second time with no appreciable differences. Another half-hour of padding is all it is. I don’t think I did anything very sidequesty at all this week. I’d decided to put that biz on hold until I got the hookshot at least, as that seems to be the key to a lot of puzzles. Also, I think that it might be the tool that I’ll get in the next dungeon, the Ancient Cistern. Now that I had a big ol’ stock of Dusk Relics from the Silent Realm, I was able to upgrade a whole buttload of my equipment, so now, among other things, I have the best Beetle and a slingshot that fires a whole spread of seeds. How much use that will be, I don’t know, but I have it! Also a shield that automatically regenerates its durability. No more dumping rupees into rupee shield repairs! Of course, I decided to take a break as soon as I stepped into the Ancient Cistern. Have to keep up with tradition, you know!